Research in the Mudring group is driven by understanding fundamental structure-property relationships with the aim to design new materials for energy related applications for a sustainable society. 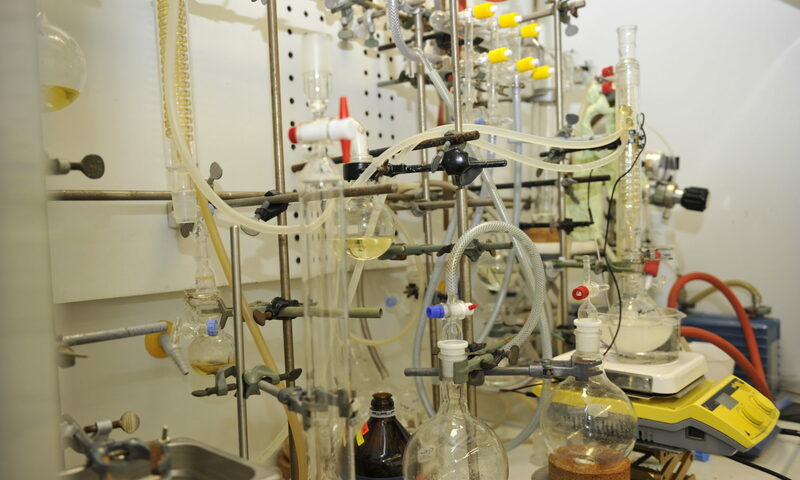 In this effort, on the one hand, ionic liquids are investigated as a transformative tool in the synthesis and development of improved materials for energy related applications. On the other hand, complex intermetallics are studied, specifically how the relativistic effect present in heavier metals can be used to uncover new compounds with unusual properties. Both classes of materials, ionic liquids and complex intermetallics, have in common that they are highly modular which offers a unique opportunity to discover the unimagined. Applications that are in mind are energy efficient lighting, (photo-)catalysis, magnetic refrigeration and thermoelectric energy conversion. All of which help, in a direct or indirect way, to meet the Sustainable Development Goals as being put forward in the United Nations Development Programme. In our advanced exploratory synthesis of materials as bulk, crystalline, nanosized or as thin films, we use a wide range of classical and unconventional synthesis techniques. These include high temperature solid state synthesis, solvo- and ionothermal synthesis, microwave and ultrasound assisted synthesis, physical vapour deposition and sputtering. We put strong efforts into developing and advancing the synthetic techniques and optimizing them for the designed synthesis of a specific material. Pioneering development of nanosynthesis in ionic liquids was made possible through two grants provided by the European Research Council (ERC). For the characterization of the chemical and physical properties of the produced materials we use a wide range of routine techniques including elemental analysis (EA), differential scanning calorimetry (DSC), thermogravimetry (TG), IR and Raman spectroscopy, NMR and MS spectroscopy, magnetometry (SQUID, VSM) and others as needed. Our special expertise is in the characterization of optical properties through advanced photoluminescence spectroscopy (extending from the VUV to the NIR from low to high temperatures on different timescales) and in structure determination with diffraction and scattering methods. We advanced the in-situ crystal growth for sub-ambient melting ionic liquids on the diffractometer for structure analysis. In our efforts, we also make use of large-scale facilities for X-ray and neutron scattering and diffraction studies such as DESY, MAXIV, PSI, BER, ISIS and the coming ESS where we will be part of a research team developing in-situ thermoanalytic instrumentation. To understand structure-property relationships and to analyse and predict materials’ properties we use computational modelling tools. We mostly employ DFT-based methods as embedded in the VASP, WIEN2k, Crystal or GAMESS codes. For the analysis of chemical bonding, we use COHP (crystal orbital Hamiltonian population) or ELF (electron localization function).